When my kids were growing up, one of the fun things we would do as a family was to throw a pizza party for their childhood friends. I was always game to host one provided they would help me clean up afterwards. It’s been quite a few years since we’ve done that now they are all grown up and are busy with their own lives. 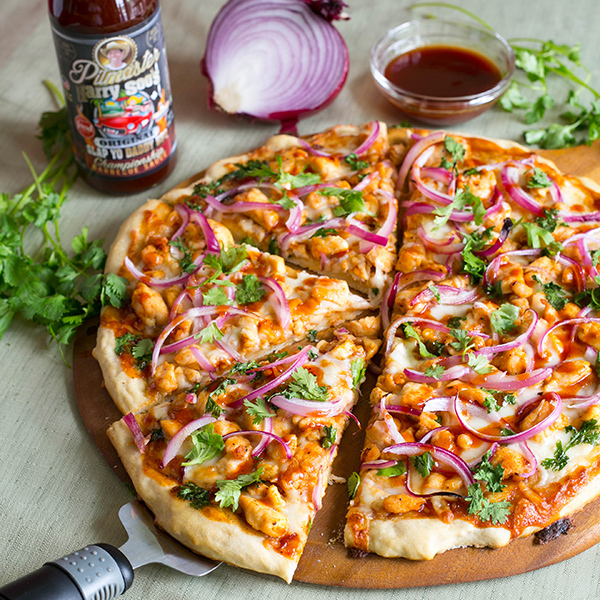 So I thought to myself, wouldn’t it be nice to get nostalgic and make some grilled pizza with leftover barbecue chicken. It also gave me an opportunity to play my brand new barbecue sauce in a fun way besides just on smoked meats. 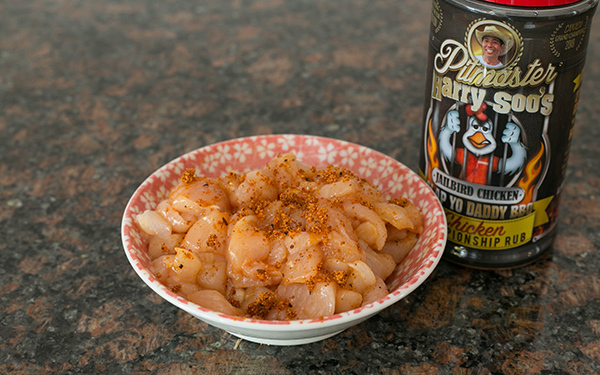 I’ve been tweaking my sauce on the comp circuit since 2008 and have been asked by many to bottle it. Well, after lots of trial and error to scale up my kitchen recipe, the sauce is finally ready for you to try. You can order it on my store page and my Internet sales partner David Sievers will fulfill online orders from his distribution center in Cleveland. For wholesale and store sales, my sauce director Steve Botkin will handle your orders. He can be reached at 714-276-5845. 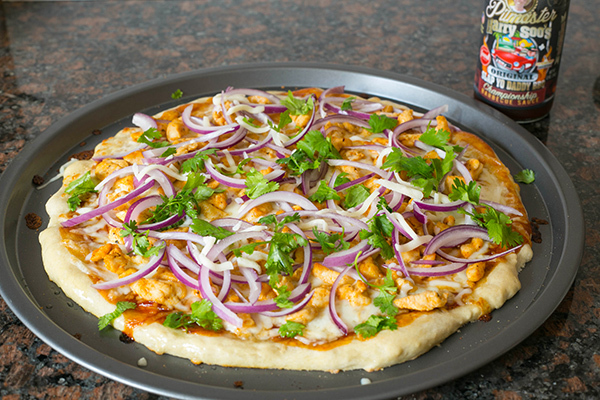 I know I’m biased when I say that my new sauce tastes awesome on a simple grilled chicken pizza. Season the cubed chicken meat with SYD Chicken Rub. 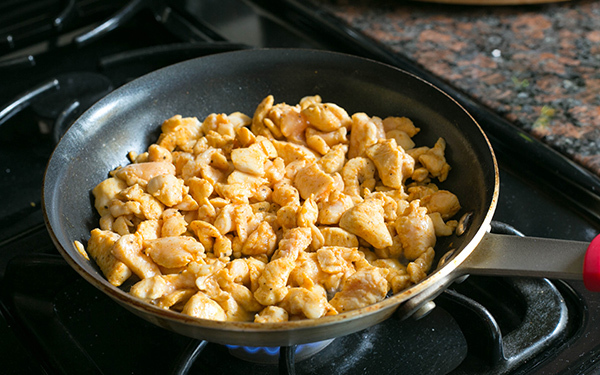 Cook it over the stove top on a non stick pan with a little cooking oil (optional). Set aside to cool. Set the oven to 450 degrees (or according to the instruction on the pizza dough package). Prepare the pizza dough according to the package instruction. Use a pizza baking pan or a regular baking pan, stretch out the dough to 12 inches round. 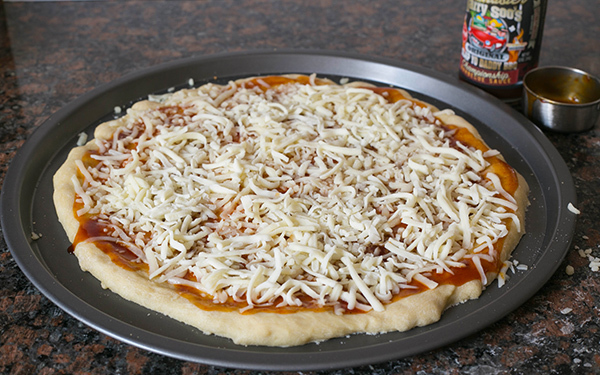 Gently spread the SYD BBQ Sauce on the dough to cover as much area as possible. Sprinkle the cheese over the SYD BBQ Sauce. Add the cooked chicken over the mozzarella cheese. Bake accordingly to the dough package, between 8-10 minutes, until the crust almost done. 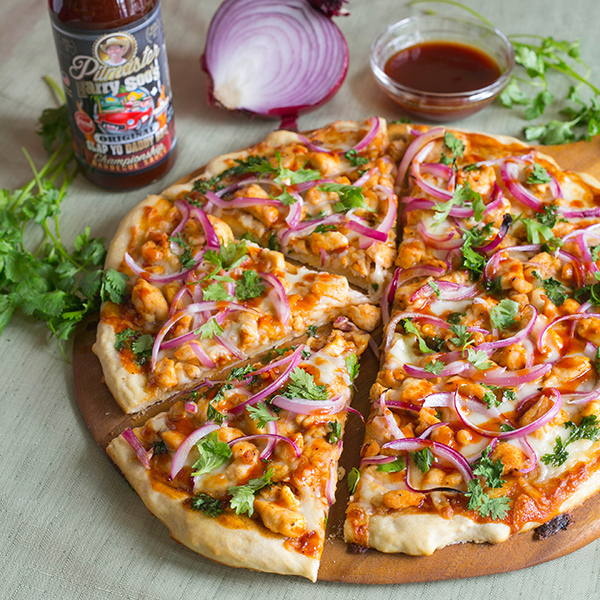 Take out the pizza, sprinkle with the sliced red onions and cilantro and bake another 2-3 minutes. When the pizza is done, drizzle more SYD BBQ sauce on top of the pizza. Serve immediately. Loved this! Made two side-by-side – one exactly as described, and one also adding caramelized onions. That second one was the consensus winner! Thanks for a great idea – we’ll be doing this again!